The gifts you make to Riley Children’s Foundation make a tangible difference in the lives of countless children. Today, we want to share the story of one child directly helped by the generosity of donors: Ian Vierling from Greenwood, Indiana. Ian is one of approximately 1,700 children who receives treatment at the Cleft and Craniofacial Clinic at Riley Hospital for Children at Indiana University Health. Riley’s clinic is one of largest of its kind in the United States. Riley’s comprehensive, multidisciplinary team approach allows patients born with a facial difference to lead healthy, happy lives. The Cleft and Craniofacial Anomalies program receives grant support from Women for Riley, a dedicated group of donors and volunteers who work through Riley Children’s Foundation. Thank you so much for your work with Riley Hospital for Children, Riley Children’s Foundation, and the kids they care for. Your support amplifies what is already a world class medical institution. Specifically, your financial support of the DynaCleft treatment used by the Craniofacial team has created improved pre-surgical results for children with cleft-lip and palate conditions. 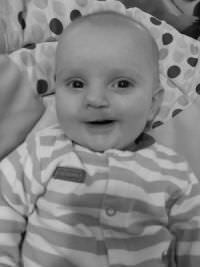 Our son Ian was diagnosed with his cleft-lip and palate at 20 weeks of pregnancy. Obviously, this was a difficult time for our family as we knew nothing about his condition, why it happened, and what challenges would lie ahead. As we began learning more and finding support, we quickly found our way to the Craniofacial team at Riley where we were connected with Dr. Tahiri. We learned that Ian’s cleft-lip was wider than the average cleft and Dr. Tahiri introduced us to the DynaCleft tape therapy. DynaCleft is a pre-surgical therapy that works to bring the opening of the upper lip closer together. The nasal elevator aids in lifting the cartilage, providing better symmetry for the nose. We began using this therapy four days after Ian was born. The results of this tape therapy are nothing short of extraordinary. Additionally, the DynaCleft is very user friendly. At no time did we feel overwhelmed or discouraged using the product nor did we feel that our son was uncomfortable with the treatment. We were even able to show other family members how it worked in case they had to watch Ian. Without your involvement, this therapy would not be available to many families seeking treatment for this condition. We are forever grateful for your support of this treatment as its results are truly incredible. Ian is now recovering from his first surgery and we couldn’t be happier with the outcome. Our son Owen was born via a scheduled, repeat C-section on July 14th, 2014. While the nurses assessed Owen, they noticed he wasn’t breathing ideally so he went to the NICU for some monitoring. We soon learned that Owen had a cleft palate and would be transported to Riley Hospital for Children the next day. My world shattered. That night I was finally able to see him. He was perfect. A neonatologist came to visit us and discuss the plan for Owen. We were told due to his cleft palate, small jaw, and breathing difficulties he was diagnosing him with Pierre Robin Sequence. PRS is a set of abnormalities affecting the head and face, consisting of a small lower jaw (micrognathia), a tongue that is placed further back than normal (glossoptosis), and an opening in the roof of the mouth (a cleft palate). Once Owen arrived at Riley he had a handful of tests done. An ECHO of his heart showed some cardiac issues. At a week old he had a sleep study to determine if we needed a jaw surgery to improve his airway. The results came back the same day, only hours after the test ended (we were told it would take a couple of days.) Dr. Youssef Tahiri (our plastic surgeon) and Dr. Matt (our ENT) came to our room to deliver the results. Owen had severe obstructive apnea and went in for emergency jaw surgery the next morning. During our NICU stay we also met with a genetic doctor, Dr. Weaver. He ordered chromosomal testing, which came back showing our Owen has Trisomy 9 Mosaicism. He is one of only a couple hundred known cases in the entire world. We have dealt with many health problems since our first stay at Riley and every doctor, nurse, and staff member has made our stay as pleasurable as possible. When you’re told your child is a medical mystery, sometimes hope seems lost. Dr. Tahiri, our plastic surgeon, stands out to us and will always have a place in my family’s heart. I truly believe he saved our son’s life twice. He truly cares about his job and the patients that he treats. He has made surprise visits to our room, and has called me after work hours and on weekends to give us test results that we were so desperately waiting for. We are at Riley so often, we joke about it being our second home. I’m so thankful for those who make it feel like as much as a home as possible. In the first week of Jack’s life we learned that whatever was going on with this big ol’ head was something that couldn’t be treated by his pediatrician. In fact, our doctor wasn’t able to determine exactly what was happening with Jack’s head but what she did know was this: we needed to go to Riley Hospital for Children. 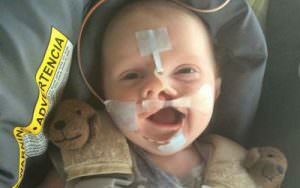 When Jack was just two weeks old we had an appointment with Dr. Joel Boaz, one of the neurosurgeons at Riley Hospital. Dr. Boaz was able to view the skull films of Jack’s head and inform us that he was born with craniosynostosis, the early fusing of the plates of the skull, which happens in about one in every 2,500 births. This condition doesn’t allow room for the brain to grow because the skull can’t expand. 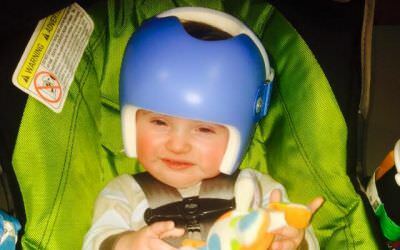 Jack’s condition was especially serious because he has bicoronal craniosynostosis, which means that both sutures on the sides of his head were fusing early, so he needed to be scheduled for surgery before his brain growth was at risk. In the months before surgery we had a couple of appointments with Dr. Boaz and craniofacial plastic surgeon, Dr. Roberto Flores. They created a treatment plan for Jack, which included a first surgery to put a distraction device in his skull and make room for the brain by pushing it out in the back. The second surgery would be a small one to remove the distractors, and the third surgery would be a cranial vault reconstruction and forward orbital advancement – a major skull surgery to give the brain even more room to grow and create a more natural look to Jack’s head. All of this was terrifying to hear. The most reassuring piece of information that Dr. Flores shared with us was that, while serious, the actual surgery was about a 3 out of 10 on the difficulty scale for the surgeons. What a relief! After the first surgery Dr. Flores, our main contact, left Riley for a new opportunity and we began to see Dr. Youssef Tahiri. He jumped right in, getting involved with our family and making sure that Jack had a care plan that worked for all of us. He is amazing with Jack and our older son, and he always sits and answers as many questions as we might have. 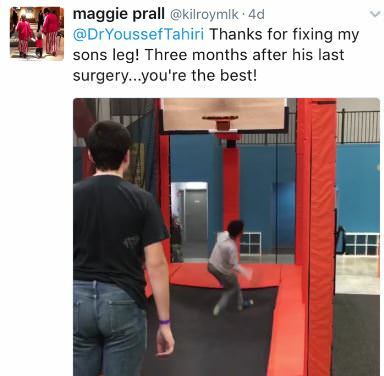 Dr. Tahiri was the first person to come into our pre-op room on the day of the 3rd and biggest surgery, and he made us feel at ease right away. My husband and I love that he is so passionate about his work. Dr. Tahiri takes great pride in creating good looking Big Ol’ Heads with lots of room for brain growth! Although a hospital stay is always rough when your little one is bandaged and hooked up to monitors, we couldn’t have been more pleased with the care we received from the nurses in the burn unit where the cranial surgery patients usually go. All of the nurses, but especially Erin and Janiel, took amazing care of Jack and our family. They managed Jack’s pain, kept us informed about what was happening and what to expect, and helped us with any needs or requests. We enjoyed their company and always felt like we could ask them for anything. Jack’s big new head could grow and change and he could need more surgeries. Jack has a genetic condition called Meunke’s Syndrome, so he also sees Dr. David Weaver in genetics at Riley. This condition means Jack might also experience hearing loss, learning problems, and vision issues, but all of those things are less likely because of the early diagnosis and intervention that Jack received at Riley. Because of the amazing resource of Riley Hospital right here in our hometown, our family will never have to worry about driving out of state to get the best medical care for our child. We will never have to wonder if the doctors are as good as they could be. We will never have to wonder if we are doing the best we can for Jack. In fact, Dr. Tahiri tells us that what we should be worrying about right now is that he saves some ladies for the rest of the guys in town!